As the world is making the transition to consuming more video content, tech giants have been trying to power on the ‘livestreaming trend’ too. And, it looks like YouTube is following the trend too. YouTube announced on its blogpost on Friday that it’s new ‘mobile live streaming’ feature that will be baked right into the core YouTube mobile app. It also claims to be the first to ever broadcast a 360-degree live stream during Coachella. “Over 21 million people tuned in to watch Coachella on YouTube this year” states the blogpost. The feature will work similar to Facebook Live and Periscope, with streamers having the ability to see live comments from viewers. However, YouTube's live streaming will take advantage of the company's live streaming infrastructure, which it has been enhancing since its debut in 2011. The live broadcast interface also includes a viewer count, a like count, and a button to switch between the front and rear cameras. You can also take a photo before you begin your live stream to add it as a banner for your broadcast. Facebook too has been offering Live video streaming for select publishers and just two days ago Tumblr announced its own ‘Live Video’ integration. 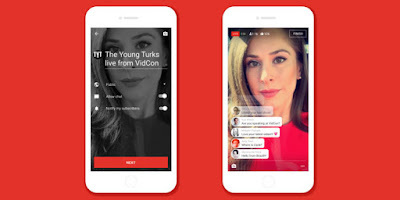 It will be interesting to see how YouTube’s mobile live streaming fares and when it is made available to the public. On the other hand, YouTube claims that when this feature is rolled out, it will be faster and more reliable than any other live streaming product out there. Launching today at VidCon, live streaming will be available for select YouTube publishers - The Young Turks, AIB, Platica Polinesia, SacconeJolys, and Alex Wassabi. However, it promises to roll it out to all users in the near future.